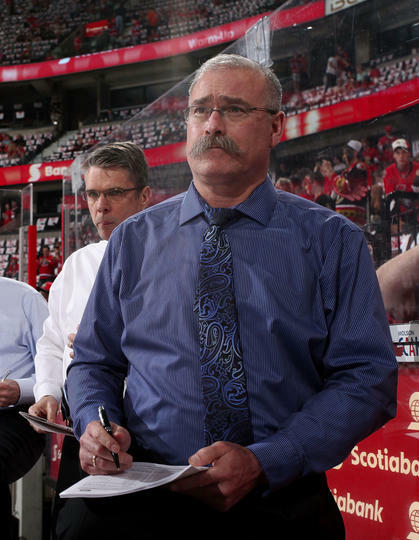 Ottawa Senators‘ coach Paul McLean won the Jack Adams Award, announced by the NHL Friday. The Jack Adams award is presented to the coach who is considered to have contributed the most to his team’s success. The Senators’ bench boss was among the well-established company of Anaheim Ducks’ head coach Bruce Boudreau and Chicago Blackhawks‘ Joel Quenneville. The other two coaches have won the award in past seasons, Quenneville when he was coach of the St. Louis Blues in 2000 and Boudreau in 2008 with the Washington Capitals. Boudreau and Quenneville made their cases this season, having led their teams to the top of the Pacific Division and top of the league, respectively. With Boudreau at the helm, the Ducks experienced their best season since their 2007 championship campaign. Not to be outdone, Quenneville’s Blackhawks put up some stellar figures this season including the second-longest team point streak in league history. Both coaches had extremely successful seasons and were no doubt shoe-ins for coach-of-the-year nominations. But it was McLean who guided his Senators to a seventh-place playoff berth and a 25-17-6 record with a total of 382-man games lost to injuries. The majority of the injuries were to top players like Erik Karlsson, Jason Spezza and Craig Anderson. “That was a tough day for us … in the first two weeks of the season to have all those guys go down,” McLean said. With class, the coach quickly channelled a lot of the praise to his veteran players who were still in a line-up mangled by some serious injuries. Coach McLean also congratulated Boudreau on his season and Quenneville on one that is on-going, whose team looks to win it all currently up 1-0 against the Boston Bruins in the Stanley Cup Finals.